BlogHome » News » News » Working with SharePoint and OneDrive – How does document management work in Office 365? Document Management – such as creating, distributing, storing and searching for documents – is a big deal for most desk workers. A McKinsey Global Institute report in 2012 found that workers spent 19% of their time searching for and gathering information – a whole day per week!‘Traditional’ ways of working with documents are quick and easy, at least from the point of view of creating, storing and editing. Documents tend to be stored on a local PC, in a personal folder on the network, or on a network shared drive.Filing consists of knowing which folder to put a document into.Searching is, well, tricky!Version control is managed by creating copies of a file, of the form MyReport_2017_10_09_b.docx. If a document needs input from other people, it is emailed, and people (hopefully) track changes and email an updated version back.As long as people put files on the network drive, they are backed up and other people in the team have access to them.Permissions can be added to folders to keep things safe.This works. To an extent. But it’s not particularly 21st century. Cloud services give new and better ways to do things. Microsoft 365 is an industry leader and has been investing huge resources in producing better ways for people to work with documents. SharePoint and OneDrive are at the centre of this. As described here, OneDrive for Business is for personal file storage, and SharePoint is for teamwork. Fundamentally, they work the same way. You get a big chunk of space on Microsoft’s servers to store files. You then work with this either using your web browser, a phone app, or by ‘syncing’ the files down to your local drive (like DropBox).You add folders, and can organise your files into these just like you always have done. To edit a document, double-click it, edit and save. There is no difference to the core concepts of managing your documents.What you do get, though, is a load of functionality that you can use to make your life a whole lot easier. OneDrive is your personal storage space, and you are left to organise your documents in folders however you choose.SharePoint, however, is a whole different game. This is where you put files that will be used by your team, or need to be found by the whole organisation. Reports, policies, design documents, manuals, user guides, project files, forms, quotes, contracts – all of these are important company documents that need to be managed in a structured way. And these are the documents that staff are wasting time every day trying to find or collate.SharePoint gives you a wide range of tools to help manage large numbers of documents.The way that documents are filed is highly structured. SharePoint comprises a ‘Site’, which can have lots of Subsites. Each subsite is a place to store related information – files, task lists, calendars, discussions, notes… By building up a tree structure of sites that represents the way the organisation is structured, people can clearly see where relevant information is likely to be.When a document is filed, it isn’t just placed into a folder. The document can be tagged with any information you like to describe what it is. Project, department, technology, discipline, country, client, document type… whatever it is that categorises what you do. By tagging documents as they are added to SharePoint, you suddenly get a search that works – you can type in a keyword, and refine your results based on the tags. Documents can be found based on what they are, and what’s more, people can now browse information that the company holds on a particular topic. Think of a public library. If you want a book on Jam Making, you quickly find non-fiction, the ‘Cookery’ section, ‘Home Preserves’, and browse the books that are available. Alternatively, you can go to the computer or index cards and search in a similar way. You can see what books are in, and which are out. This is only possible because the librarian has taken the time to properly tag, index and place every book, and record which is in and which is out. That’s the concept behind a formal document management system, which is what SharePoint can give your organisation. OneDrive files are visible only to you (and the administrator, should they need to access them). In your OneDrive, you’ll find a folder called ‘Shared with Everyone’. Files placed in here can be seen by anybody in your organisation. For files stored anywhere else in OneDrive, it’s easy to share them with colleagues. Right clicking on a document gives access to the ‘Share’ menu. You can quickly create a link with permissions to read or edit, and restrict this to specific people, or anyone at all. You can set your link to expire after a certain time.The huge advantage of sharing a file rather than sending an attachment is that a number of people can work on file at the same time. You can continue to edit it while colleagues are adding comments, and people can see changes as the document develops.You can remove the edit permission at any time.SharePoint is similar, in that any document can be shared using the same process.However, a well-structured SharePoint system will be set up so that only relevant people have access to particular sites. The Finance Site will only be accessible by the finance team; the Policy Library can be read by everybody, but only edited by HR, and so on. This means that documents are kept safe by simply filing them in the correct place, and the end-user doesn’t need to worry about security. If you use a Network Drive to store files, you have very limited ways to manage your documents. They are hopefully backed up every night, buts that’s about it.SharePoint and OneDrive both store every previous version of your document. With no effort from you, you are able to look through previous edits that you (or others) have made and revert to a previous version.If you want to edit a document, you can ‘check it out’. This locks it while you are working on it so that other people can’t make changes at the same time, overwriting your work. Once you check it in, a new version is created with your changes.Alternatively, if you don’t check the document out, other people can simultaneously work on it. Excel, Word and PowerPoint will indicate areas that other people are working on so that you can’t work on the same part, and changes are all merged together.Workflows can be quickly added to manage the approval of documents. You can send a document to a number of people and SharePoint can ask them all to review it at the same time, or manage a process so that they review the document sequentially.Complex workflows can be used to create sophisticated business processes: managing the signing of work orders, tracking of approvals, management of incidents and so on. Organisations such as Universities and Local Authorities use SharePoint extensively to manage paper-based processes involving thousands of documents. Microsoft has produced some highly advanced features that are readily available from within Office 365. Protect your documents by placing encryption within the file. Only people that you authorise can read the document, even if it is distributed outside your organisation. Create rules to prevent files or emails from being deleted for a set period of time, and to automatically delete them once a time period has expired. Automatically scan documents and emails for sensitive information, such as credit card numbers, and prevent these from being distributed. Ensure that corporate documents can be accessed by staff on their mobile devices, whilst ensuring you can still control the documents and remove them when needed. 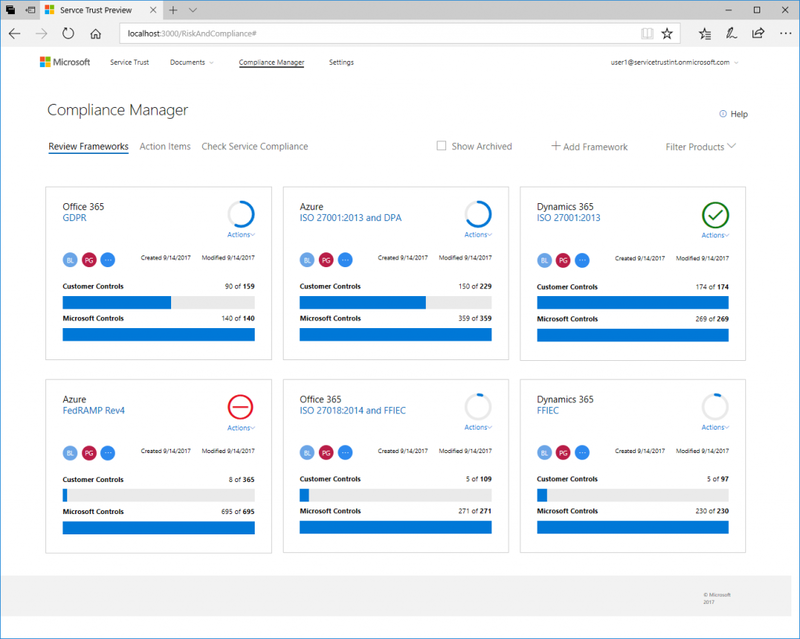 Compliance Manager is a new solution that conduct a real-time risk assessment across your cloud services, providing a score that reflects your compliance performance against data protection regulatory requirements. You can also use the built-in control management and audit-ready reporting tools to improve and monitor your compliance posture. See more here. Microsoft is working hard to produce lightweight business applications that can be used to improve efficiency. These bring together different tools to produce places where teams can collaborate, chat and plan.SharePoint is an integral part of these systems, providing the storage place for documents with all of its management features.Office 365 Groups replaces distribution groups. 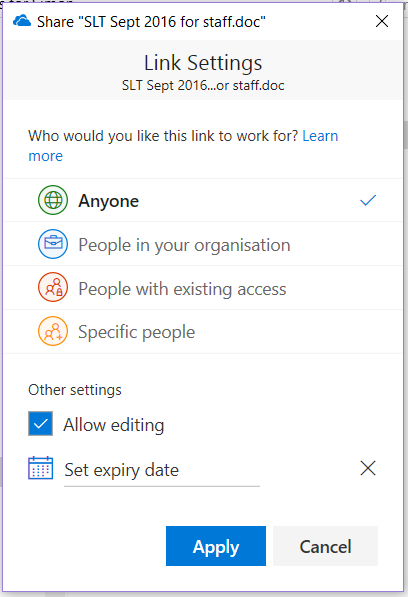 You now get a workplace that captures all emails sent to the group, but also gives you a storage place for documents, a calendar, a OneNote notebook for sharing notes, minutes and lists, Planner – which is a great new way to manage project tasks, and a SharePoint Team Site. Microsoft Teams is similar to Groups, but is based around Chat rather than emails. It is integrated with Skype, so it is very easy to create virtual meetings, make calls and chat with colleagues. Again, there is a SharePoint site created for the Team that gives document storage capabilities. Delve brings together all your organisation’s information into a single enterprise grade search experience. 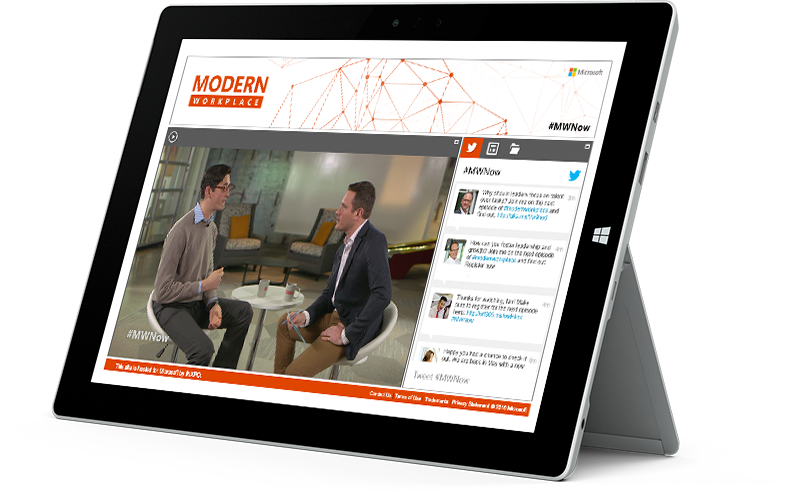 As you work, Office 365 is learning about what you work on and who you work with. When you go to Delve, this information is used to show you files, contacts and emails that are most relevant to you. You can quickly find things that you are working on with colleagues, and do simple keyword searches to discover valuable information owned by your company. Delve is one of my favourite features in Office 365 – it really does bring value to my day by being able to find relevant information quickly – even when I don’t know I’m looking for it! On top of document management tools, there is an ever increasing range of tools available for both large and small businesses. Skype for Business is a fully featured instant messaging/voice/video/conferencing tool. Planner gives modern task management capabilities. Staff Hub is a job-allocation tool for staff or shift workers. Outlook Customer Manager, a simple customer management solution. Microsoft Bookings provides appointment services for your clients. Microsoft Video for managing video libraries. Microsoft Listings, an easy way to publish your business information on top sites. Microsoft Invoicing to create professional invoices. Office 365 is working hard to provide organisations with a wide range of high quality tools that can make a genuine difference to efficiency and security. next post: 60 Second Briefing: What is Flow?